Greek Tourism Minister Elena Kountoura was one of the officials representing Greece at the annual Greek parade in honor of the country’s Independence, held on Sunday April 22 on Fifth Ave in New York City. 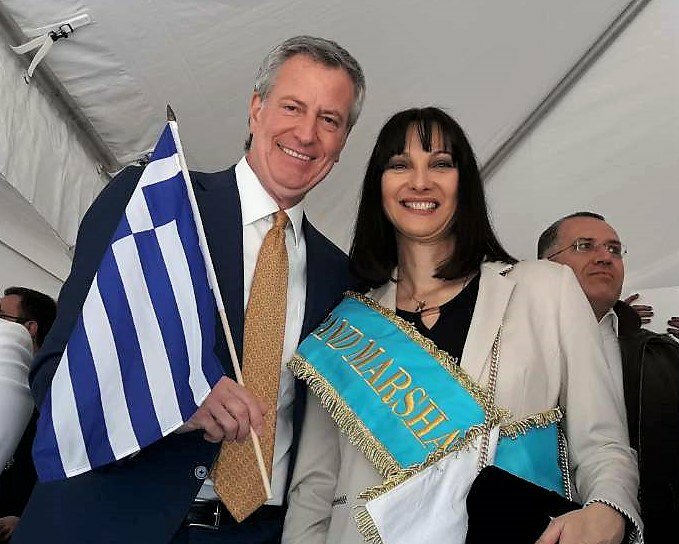 Greek Tourism Minister Elena Kountoura and New York Mayor Bill de Blasio. Held by the Federation of Hellenic Societies of Greater New York, the parade gathered hundreds of Greeks from organizations including schools, communities, associations and federations. On the sidelines of the parade, Minister Kountoura met with officials including New York State Governor Andrew Cuomo, New York Mayor Bill de Blasio, Senator Carolyn Maloney and District Attorney of Nassau County Madeline Singas. The parade was also attended by the Secretary General of the Tourism Ministry Evridiki Kourneta, Central Macedonia Governor Apostolos Tzitzikostas and the Consul General of Greece in New York, Dr. Konstantinos Koutras.